This Wednesday, just in time for our favorite patriotic holiday, Maptote's new USA bag will be available on Target's Red Hot Shop website. 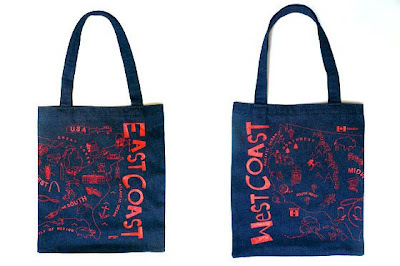 The double-sided tote features the East Coast on one side and the West Coast on the other, with graphic, screen-printed drawings of major cities and landmarks in between (Las Vegas, for example, is denoted by a slot machine and Georgia is a ripe peach). The bag, the newest in the Maptote series, is made by Brooklyn-based designers Rachel Rheingold and Michael Berick, who have combined their love of fashion and cartography. The dark-denim-and-red-ink combo has a summery-cool look, and the tote is a great replacement for those bland beige bags you've been using for groceries. Available starting July 1 for $24.99 at Target.com.